Every blogger out there rants and raves about how much they love Soap & Glory. The branding; the fact that it’s always on offer at Christmas (suspiciously so) and that it’s pretty cheap for the claims it makes, all put me off trying the brand – until now. 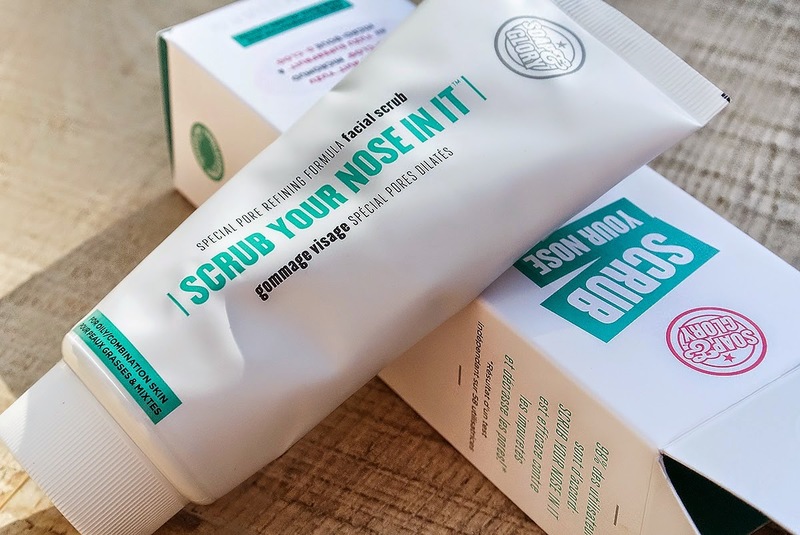 Soap & Glory Scrub Your Nose In It Facial Scrub is a gentle (very gentle) but powerfully effective clarifying facial scrub designed to unblock pores and leave skin soft and smooth without damage. If you suffer with acne, whatever the stage you’re at with it, this is a product you should definitely take note of. Brief Acne Science: Acne is caused by a specific bacterium that gets trapped by plugs of oil and dead skin; the bacterium multiplies and infects the skin as it’s cut off from oxygen causing the visible infections you see on the surface. Therefore, one of the best ways to both treat and prevent acne is to unblock these plugs, killing off the acne bacteria with oxygen. However, you should never use beads, scrubbers or grains on active spots as these can burst the spots, cause scarring and lead to a spread of infection (also why you should never pop them). Soap & Glory Scrub Your Nose In It Facial Scrub contains absolutely no visible grains or scrubbers whatsoever yet it’s excellently and beautifully powerful (but not overly so). With a base of Kaolin clay and Diatomaceous Earth (very soft, micro particles that are unnoticeable to the touch) it cleanses the skin without harsh ingredients and uses chemical exfoliants known as AHA’s in order to break down the bonds of dead skin cells whilst replacing any moisture lost. There’s also raw Willow Bark extract which is naturally loaded with the BHA, Salicylic Acid, another gentle, chemical exfoliator. There’s also brightening Yuzu oil as well as sugar maple, orange flower extract, lemon and sugar cane. There is a little fragrance but nothing overbearing; just patch test it on your neck if you’re prone to sensitivity. Apply it to slightly damp skin to activate the ingredients and gently massage for 2 minutes. With chemical exfoliators it’s the motion that causes the exfoliation rather than pressure. It rinses off easily and doesn’t leave any particularly residue. You needn’t wash your skin with your facial wash afterwards. Use 2-3 times a week and 1-2 if you’re suffering with acute acne (ask your doctor or dermatologist before hand if you’re currently on treatment in order to rule out any possible contraindications). Whatever your skin concern, you should definitely check this out. Soap & Glory Scrub Your Nose In It Facial Scrub is available here and normally £9 from boots but is currently on offer at just £6. This article first appeared on MANFACE written by Thom Watson. It was published on Friday 11th July 2014 and was last updated on Monday 3rd April 2017 at 2:01pm. It's categorised under Enlarged / Blocked Pores, Exfoliate, High Street, Soap & Glory where you'll find more related content.